It all begins with the sea. Our story began with our grandfather René K’Dual, a fisherman from Gouville-sur-Mer in Normandy, on the western English Channel. He began farming oysters in the1960s following an earlier career in whelk fishing. His two sons, Roger and Yves ensured the continuation of his savoir-faire and naturally went on to transmit it to their children on a day-to-day basis. Then one day, it was the turn of the four grandchildren, that is to say us – Hervé, Cédric, Stéphane and Emilie – to carry on the tradition, which we decided to do. In 2007, we formed a company together called Huîtres and Ko. 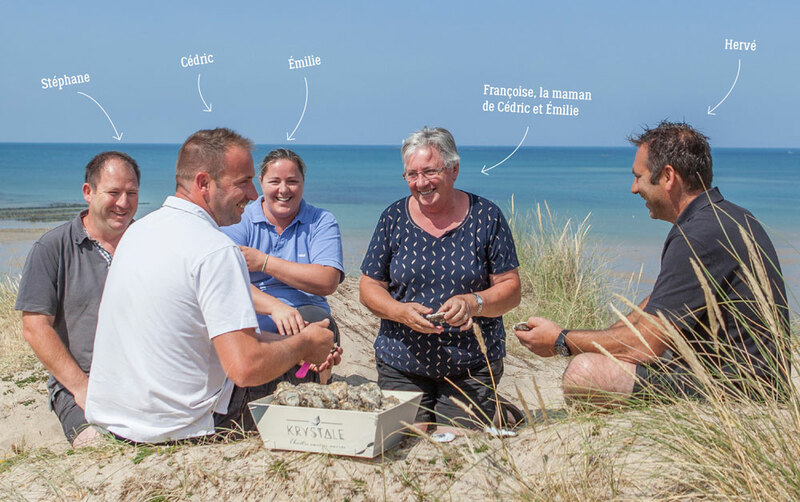 Excelling in different areas, we all bring something different to the company, but what unites us is our dedication, tradition, conviction and love of what we do, which you can see in our commitment to quality and the magnificent marine terroirs with which we work. → the search for delicious, powerful and exquisite flavours. From the well-regulated supply of spat (spawn) to the development of the molluscs, days and days of work, meticulous monitoring and dedication are involved to ensure we obtain the best results at every stage of the process with constant respect for the environment and the products. These are the goals that help create the Krystale magic. Krystale, is ultimately about a unique experience combining the delights of beautiful products that taste wonderful. Imagine an exquisitely pearlescent oyster or a softly rounded mussel, then succumb to its exceptional flavour – you will have never tasted anything like it before. The aromas are powerful with strong iodised, marine notes, the flesh is generous but delicate and the flavours are subtle and refined. be it with oysters or mussels. thanks to traditional or inventive preparations. of the experience and the taste.